Rich in carbohydrates, fructose and sucrose, jackfruits make for an excellent source of energy. Jackfruit contains vitamin C, a powerful antioxidant which helps to heal wounds and keeps the gums and teeth healthy. It plays an important role in the growth and repair of body tissues. Vitamin C strengthens your immune system by supporting the function of white blood cells and protects you from varied respiratory problems like asthma, shortness of breath, cough, and infections. Potassium-rich jackfruit helps maintain blood pressure within the healthy range and reduces your risk of heart attack and stroke. Calcium and magnesium in jackfruit keeps your bones and teeth healthy. 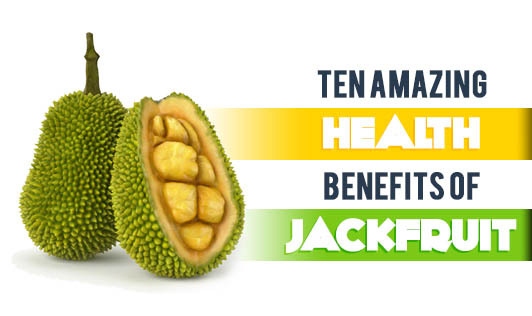 Jackfruit has anti-cancer properties. The phytonutrients found in the fruit throws the cancer-causing free radicals out of the body. The powerful antioxidants and phytonutrients like vitamin C, lignans, isoflavones, and saponinsacts in jackfruit, act as great anti-aging agents and prevent skin from sagging and wrinkling. The fiber-rich fruit regulates bowel movements, prevents constipation, and thus helps prevent ulcers and digestive disorders. The vitamin A in jackfruit is essential for healthy eyes and skin. The iron-rich fruit helps maintain blood hemoglobin levels and treats anemia. Jackfruit is a rich source of copper. Copper plays a vital role in thyroid metabolism particularly in the production and absorption of the hormone. Copper also aids in treating nervousness and tension.